On this page you will find information about money maters including Laos currency exchange info, ATM, Credit cards and so on. The official Lao currency is Lao Kip, denoted by the ISO code LAK. What does Lao Kip look like? See Laos money page. What's your money worth in Lao Kip? Use the currency exchange converter below to find out the current foreign exchange rates for the Lao Kip. Choose any currency you'd like to convert to Laos currency (Lao Kip) to see what it's worth. The best currencies to carry for changing to Lao Kip are US dollars (best), Thai Baht (very good), Euros (very good), UK pounds (good), and Canadian and Australian dollars (good). US dollars and Thai Baht are widely accepted in Laos. In up-market restaurants and hotels, bills are often presented in three choices of currencies (Lao Kip, Thai Baht and US dollars) for your convenience, however, it's almost always better to use Laos currency instead of US dollars or Thai Baht because the exchange rates in such places are usually in their favors. If you plan to go out to the countryside in remote areas, it's recommended that you exchange enough of your money to Lao Kip to cover your trip as you will not find currency exchange units outside of the capital towns of provinces, and Kip might be the only currency excepted. It's also a good idea to carry a reasonable amount of smaller bills/notes of Laos currency (1,000-20,000 Kip notes are good) to avoid hassle because traders (especially in the countryside) often don't have enough change. I often had to buy more things than I need just to meet the amount of my note. Don't be surprised if you are given sweets or candies instead of your 500 Kip change, it’s a common occurrence as 500 Kip notes sometimes run short, but this should improve in the near future as the government has put more 500 Kip notes into circulation. Credit cards are accepted at most major hotels and up-market restaurants and shops in Vientiane Capital and some major tourist cities in Laos. Expect at least 3% service charge. That doesn't include the exchange rate charge that your credit card company will charge you. Travellers' cheques are only accepted at major banks with quite high commission rates. It's recommended that you carry travellers' cheques in US Dollars or Thai Baht to avoid additional exchange rate charges. 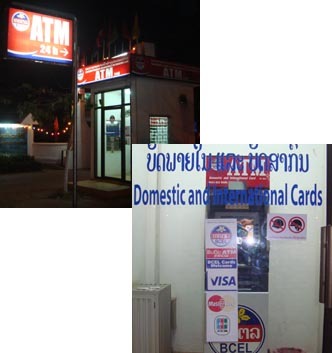 International ATM and credit card services are available in Vientiane Capital and some other provinces where there are banks, though not all provinces provide this service as yet. Lao ATMs take the cards pictured. They dispense Laos currency (LAK), usually in large bills (50,000 kip is common). Rates, withdrawal amounts and daily limits vary between banks. Tips: Some ATMs in Laos don't give you options to chose banknotes. If you need small notes, one strategy that works for me is to buy some drinks or candies at convenience stores or small shops on streets and get change. You can even ask to change more of your large bills at the convenience stores when you buy stuff from them. One thing might be worthwhile to note is that some Tuk Tuks or cabs often don't have enough change or are loathe to break large bills. To avoid frustration have small notes ready and give them exact amount. Here are examples, to give you an idea, of how much you can cash money from Lao ATMs and how much they charge (for international cards). At ANZV’s ATM you can withdraw up to 2 million Kip (US$241.5) at a time and up to 4 times a day (total of 8 million Kip per day). The transaction fee is 20,000 Kip per transaction. At JDB’s ATM you can withdraw up to 1 million Kip at a time and up to 3 times a day (total of 3 million Kip per day). The transaction fee is 30,000 Kip ($US 3.6) per transaction. As mentioned, Lao ATMs dispense only Laos currency (LAK) and daily limit is only up to 8 million kip. If you want to cash US dollars or Thai Baht or if you want to cash a large amount it is better to go into the bank and use their service. The transaction fee at BCEL is 3% per transaction to cash US dollars or Thai Baht, 2.5% per transaction to cash Laos currency (Lao Kip). Banking hours are Monday to Friday, 8:30am to 3:30pm. Please note that your card company may charge an extra fee for foreign transactions. Check before you leave home to get the best card for use abroad. It's also a good idea to let your credit card company know that you're traveling and you want to use your credit card overseas, they'll be aware so that they'll not block the card if there's huge sums being racked up that are unusual subject to your own credit card use patterns. Make a note of the credit limit on each credit card that you bring to avoid charging over that limit while traveling. Ask your credit card company how to report the loss of your card from abroad. Toll free numbers do not work from Laos, but your company should have a number that you can call while you are overseas. It is advisable to always get and keep a printed receipt for your reference when attempting to withdraw money from Lao ATM, and contact the bank that the ATM belongs to as well as your own bank immediately if you have a payout problem. Western Union and MoneyGram are readily available in major towns in Laos. If you ever run into emergency situation, out of cash or have trouble withdrawing cash from ATMs in Laos or whatever the reason might be, you can always call some one at home to wire money to you via Western Union or MoneyGram. You can get your money the same day. Western Union services are available through out the country with over 100 agencies in banks, post offices and money exchange units. In most provinces, they are located at the post offices and some banks. In Vientiane, the Western Union service units scatter all over, post office, banches of Acleda Bank, banches of Lao Development Bank and many money exchange places, just look for Western Union logo. Service fee varies depends where the money is sent from, it is only charged to send money. There is no fee to receive. Check Western Union website for more information (http://www.westernunion.com). MoneyGram services are available at branches of Banque Pour Le Commerce Exterieur Lao, Thai Military Bank, and Joint Development Bank. For both, Western Union and MoneyGram, you can chose to receive money either in the currency it is originally sent or in Lao currency. It is though often better to receive your money in the currency it is sent wether it is US dollars, Euro, Thai baht...The exchange rate is usually in the favor of service providers. It is worth doing a little calculation and comparision when you receive a big sum of money. You can always change to Lao kip somewhere else later if needed. However, if it is just a few hundreds it might not make that much different. There is no fee to receive money either through Western Union or MoneyGram. You need to present your passport (ID card or family book for Lao nationals) so... don't forget to bring it with you or you will not get your money.